Plasmonic optical fiber sensors are continuously developed for (bio)chemical sensing purposes. Recently, surface plasmon resonance (SPR) generation was achieved in gold-coated tilted fiber Bragg gratings (TFBGs). These sensors probe the surrounding medium with near-infrared narrowband resonances, which enhances both the penetration depth of the evanescent field in the external medium and the wavelength resolution of the interrogation. They constitute a unique configuration to probe all the fiber cladding modes individually. We use them to analyze the modal distribution of gold-coated telecommunication-grade optical fibers immersed in aqueous solutions. Theoretical investigations with a finite-difference complex mode solver are confirmed by experimental data obtained on TFBGs. We show that the refractometric sensitivity varies with the mode order and that the global SPR envelope shift in response to surrounding refractive index (SRI) changes higher than 1e-2 RIU (refractive index unit) can be ~25% bigger than the local SPR mode shift arising from SRI changes limited to 1e-4 RIU. 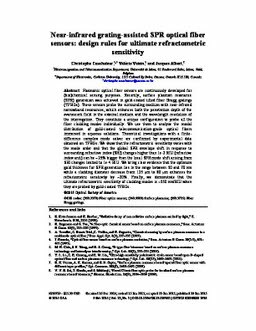 We bring clear evidence that the optimum gold thickness for SPR generation lies in the range between 50 and 70 nm while a cladding diameter decrease from 125 µm to 80 µm enhances the refractometric sensitivity by ~20%. Finally, we demonstrate that the ultimate refractometric sensitivity of cladding modes is ~550 nm/RIU when they are probed by gold-coated TFBGs.